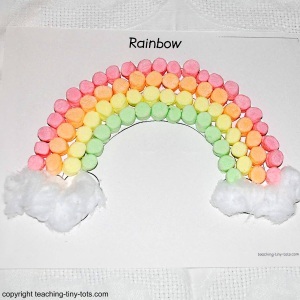 Have your child color the first 4 colors of the rainbow (red, orange, yellow, green) All bags of colored marshmallows that I have seen come in four colors. The pink marshmallows will be the red. 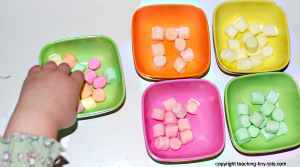 Sort marshmallows by color in small containers. Put a couple thick lines of glue in each "ray". Pull each cotton ball into several pieces. Glue cotton on the clouds. If you prefer, write the colors on each row for your child. Writing each color in the matching marker color will help remind your child which color to use. Put glue on only one row at a time. It is best to work with one color at a time or fingers will get messy with glue. We found it easier to work from the inner color to the outer color. Washed empty applesauce containers or muffin tins or egg cartons work well for sorting. Cut the paper prior to activity to 8.5 x 10.5 inches and it will fit nicely into a gallon ziplock storage bag. It will keep the marshmallows nice and offers a way to take the project home if made in school. A rainbow spans a continuous spectrum of colours. It's a phenomenon which causes a spectrum of light to appear in the sky when the sun shines on droplets of moisture in the Earth's atmosphere. Its colors are best remembered by the mneumonic Roy G. Biv. Red, Orange, Yellow, Green, Blue, Indigo and Violet.